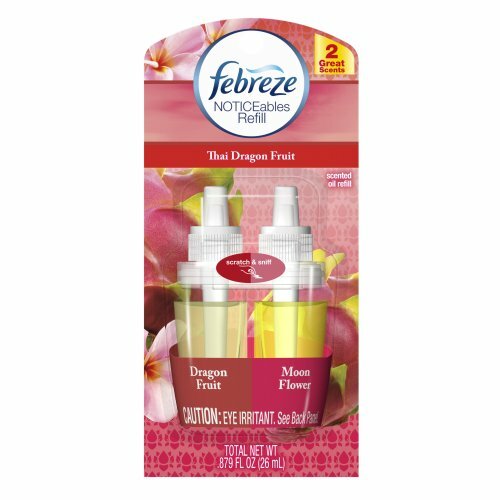 Febreze Noticeables Thai Dragon Fruit Air Freshener Refill (0.879 Fl Oz) by Febreze at Thai City Deals. SKU: 0347536. MPN: 45420. Hurry! Limited time offer. Offer valid only while supplies last. Here’s a fresh idea—an electric air freshener that alternates between two complementary scents, keeping your home noticeably fresh for 30 days. Here’s a fresh idea—an electric air freshener that alternates between two complementary scents, keeping your home noticeably fresh for 30 days. Febreze Noticeables is a convenient and inventive way to permanently eliminate underlying odors such as mustiness and pet smells, while releasing waves of warm, subtle fragrance. The alternating oils keep your nose on its toes, ensuring noticeable freshness, all month long. Just plug it and enjoy the air!